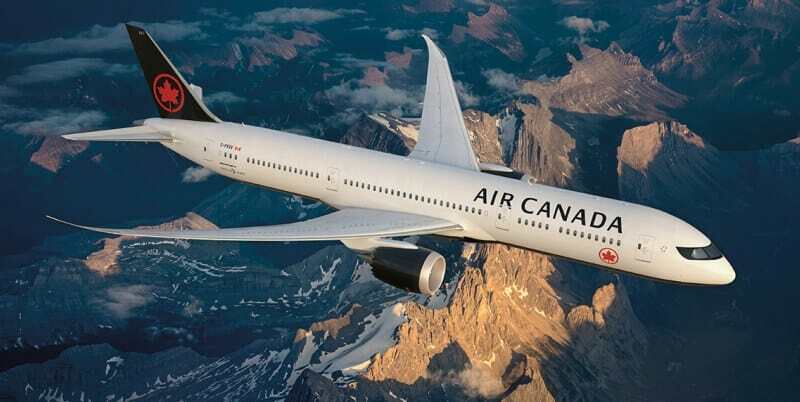 If you’re looking for air tickets to India, or more information on flights to India, check out the Air Canada flights I am reviewing in this post. I’m also assessing the sustainability of air travel and the Boeing 787 (Dreamliner) plane. 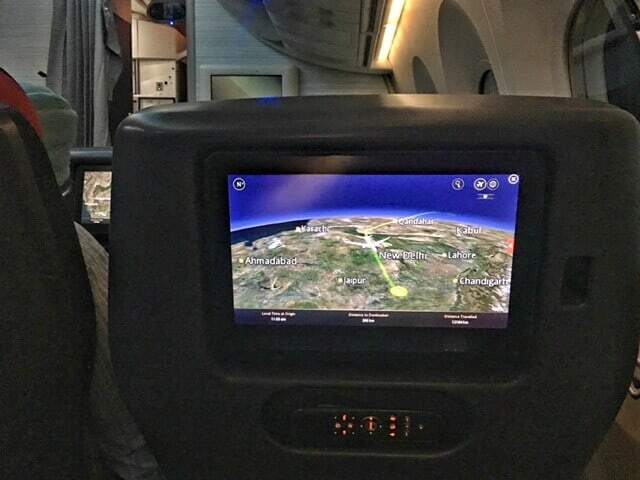 Plus, scroll down for my top long-haul flight tips. Arriving in India, from Canada, is always disorienting. The combination of long haul travel, exhaustion, jet lag, and of course the massive cultural difference makes it a shock to the system. I always try and mitigate these effects by choosing the best flights to India, drinking a lot of water, sleeping as much as possible on the plane, and relaxing in Delhi for at least three days before I start travelling or making plans. 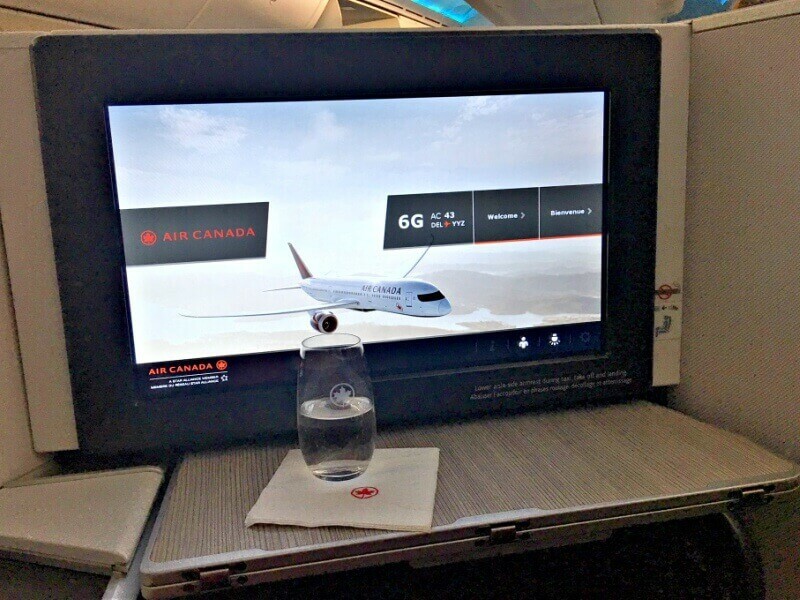 So, I was really excited and curious about experiencing the Air Canada flights, and flying from Toronto to Delhi direct for the first time on the Air Canada Direct to Delhi on the Dreamliner flight. Air Canada had (inexplicably) stopped flying to India for about 10 years, so I was thrilled when they brought in direct flights. The Toronto-Delhi direct flights started in 2016 and they fly every day. 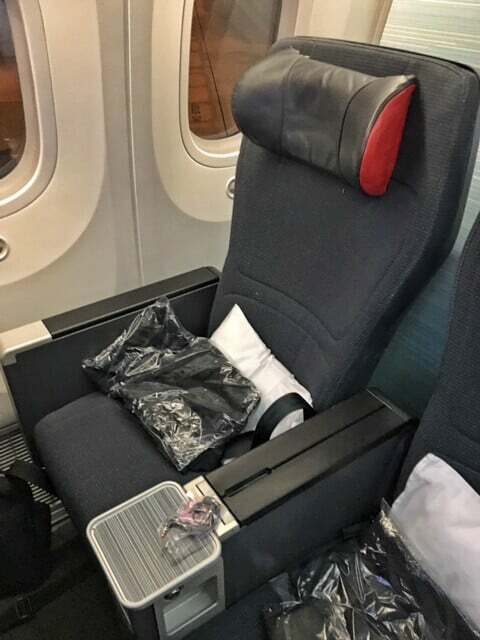 Air Canada gave me a complimentary air ticket to try out the new Premium Economy Class on the Direct to Delhi Dreamliner. 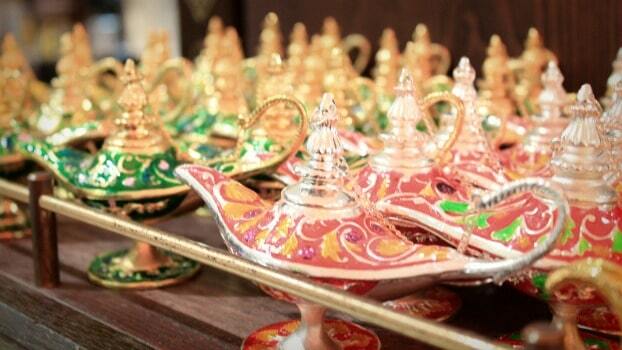 As you can imagine, I’ve had many flights to India. 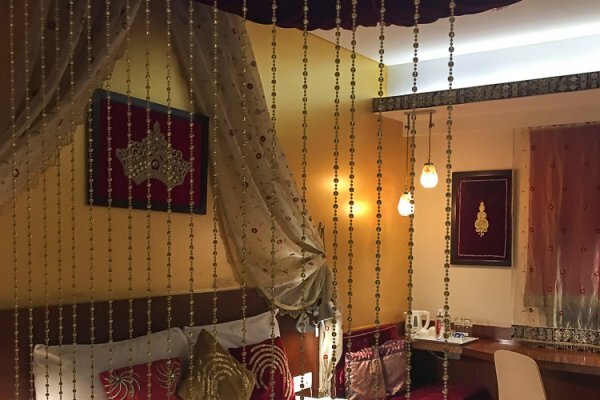 I’ve been lucky to get upgrades to fly Business Class several times to India on different airlines, and I’ve flown Economy Class several times too, so I was very curious about the difference. Whether or not you feel Premium Economy is value-for-money will depend on how you feel about space and comfort. I found it to be much, much more comfortable than economy. The seats are really big and there’s lots of leg room and even a divider between seats. Someone remarked that Premium Economy is similar to what Business Class used to be like. I also like the small cabin, only 21 seats. I found it easy to sleep on the plane – with the help of a great neck pillow – and managed to get in about six hours. The seats recline more than Economy, but not flat like Business Class. There are two washrooms, and they are the most spacious and nicest washrooms I’ve ever seen on a plane. I thought these washrooms were just for Premium Economy, but on my flight, one was shared with Economy and one was supposed to be for Business Class (but I snuck into this one several times). If you want to avoid washroom lineups, book a seat on the right-hand side of the plane. I had checked SeatGuru, and following their advice, booked the last row so I could fully recline my seat without bothering anyone. A nice perk of flying Premium Economy is that meals are served using proper plates and cutlery, like in Business Class. No plastic or throwaway materials. The service is good and there are more food options. In fact, I found the flight attendants to be incredibly friendly and helpful. However, I can’t give the Indian food option very high marks. It was actually more like fusion Canadian-Indian food, and rather tasteless compared to authentic Indian food. I noticed that a very large proportion of passengers were Indian, so I can only wonder what they thought of the food. I would strongly suggest that Air Canada up their game in this department. But it was my only disappointment with this flight, so I really shouldn’t complain. There are several other benefits to booking Premium Economy that really help make a long flight more bearable when you’re looking at air tickets to India. 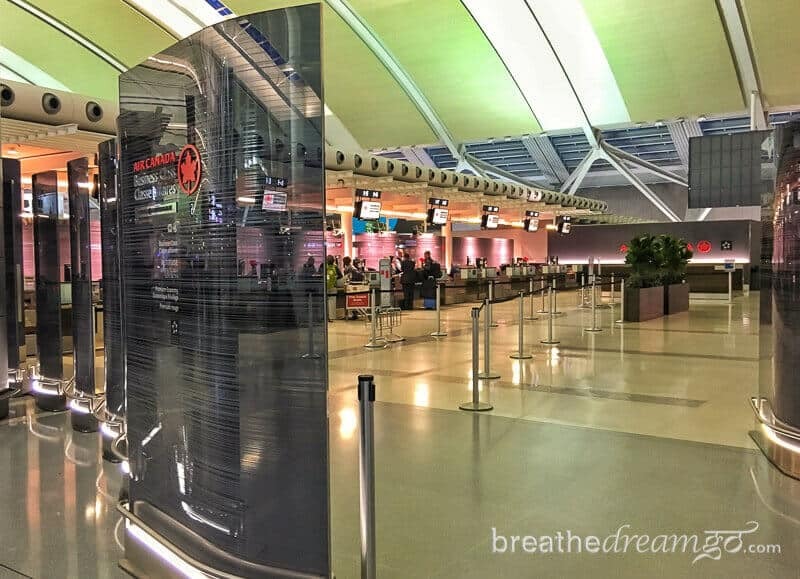 You can check in at the Business and First Class counter, which is a separate section at Toronto Pearson International Airport with very short lineups, and you get priority tags on your luggage. Unfortunately, though, you don’t get access to the Maple Leaf Lounge – which is an exceptionally good lounge at Pearson. Finally, even though the flight left Toronto a bit late, it made up time and we actually landed early in Dehli. It honestly seemed like a dream, to get on a very comfortable plane (more on the Dreamliner below) in Toronto and land in Delhi without stopping. I also appreciate the scheduling. You leave Toronto at a reasonable time (early evening) and arrive mid-evening in Delhi. I got to my homestay just in time to unwind and go to bed at my usual time – which really helped to mitigate the jet lag. Two thumbs up and (almost) full marks for the Air Canada Direct to Delhi flight and Premium Economy. Aside from bland food, it was a great flight. 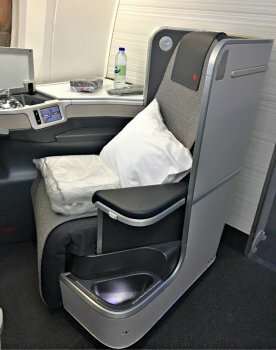 I flew Air Canada Signature Service (formerly Business Class) on my return flight in early April, from Delhi to Toronto non-stop. It was virtually the same great non-stop flight I took to India in September 2017 on the Dreamliner. I am now completely addicted to the idea of a non-stop flight — and Air Canada now has the only non-stop flight between Toronto and Delhi — and to flying on the Dreamliner. I really liked the Premium Economy service, and for the price, I think it’s a great deal. I was able to sleep during a 14-hour flight, which to me, is the most important criteria. However, if you REALLY want a good sleep during a long flight, you cannot beat Signature Service and seats that fully recline into a flat bed, a quilted mattress pad, duvet, and pillow. 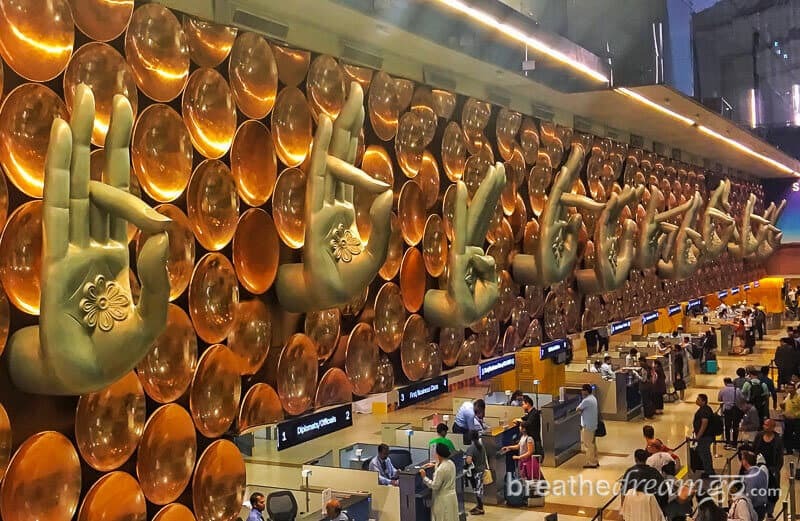 The flight leaves Delhi at the very reasonable hour of midnight — many international flights leave Delhi in the middle of the night. After settling in, I watched a movie on my own large screen while being served dinner, with my seat in semi-recline position so that my legs were raised. I ate my meals on a large tray, with a white table clothe and porcelain plates, and enjoyed a very nice white wine with dinner. Chef David Hawksworth of Vancouver (owner of Hawksworth Restaurant) uses local ingredients to create the Canadian cuisine served. And Sommelier Véronique Rivest, the winner of the 2006 and 2012 Canada’s Best Sommelier competitions, the 2007 Wine Woman competition in Paris, the 2012 Best Sommelier of the Americas competition, chooses the wines aboard. On flights between Mumbai, Delhi and Canada, chef Vikram Vij chooses a destination-inspired menu — and this time, the Indian food was delicious! And I found they were able to quite easily meet my gluten-free needs, too. As well as two meals and a snack during the flight, Air Canada Signature Service offers a Dine on Demand option. Plus, there’s a lot more benefits to booking Signature Service including priority check-in and boarding, use of the Signature Suite or Maple Leaf lounge, a valet service, and more. You can find out all the benefits of Signature Service on this page, and check out a 360 degree view of the cabin and pod below by clicking and dragging your cursor on the image. Needless to say, it was a great experience. And best of all, I arrived in Toronto on Sunday morning and was playing with my niece and nephew by 7 am, feeling fairly well rested. Refillable bottle. Drink as much water as possible: I have experimented with this and found it to be true: The more water I drink, the better I will feel after landing. I feel certain that when I manage to drink upwards of four litres of water on my flights from Canada to India (that range from 13 to 16 hours in the sky), I suffer less jet lag. I bring my own refillable bottles and fill them at the airport, and then I ask the flight attendants to refill them often. A neck pillow. I used to think that people carrying around neck pillows in airports were wimps. Not anymore. Happily, I won one, and found it helped me sleep and greatly reduced my usual post-flight neck ache. Compression socks or stockings. I decided to buy a pair for this flight as I was almost 13 hours in the air. I found my legs felt better and were not swollen. Noise cancelling earphones. These can help you sleep, as well as make movies and music more enjoyable. Overnight bag. I always pack a small bag with things like moisturizer, lip balm, travel size toothbrush and toothpaste, ear plugs, eye mask, cosy socks. My luxury item is a small spray bottle of flower water for spritzing my face. Makes me feel instantly cooler and moister. Asian (Indian) Vegetarian meal. I joined a discussion on Facebook about what specialty meals people order and I was surprised to discover a LOT of people order the Asian / Indian Vegetarian meal. It really does often seem to be the most tasty. I never thought I would become an airplane geek. 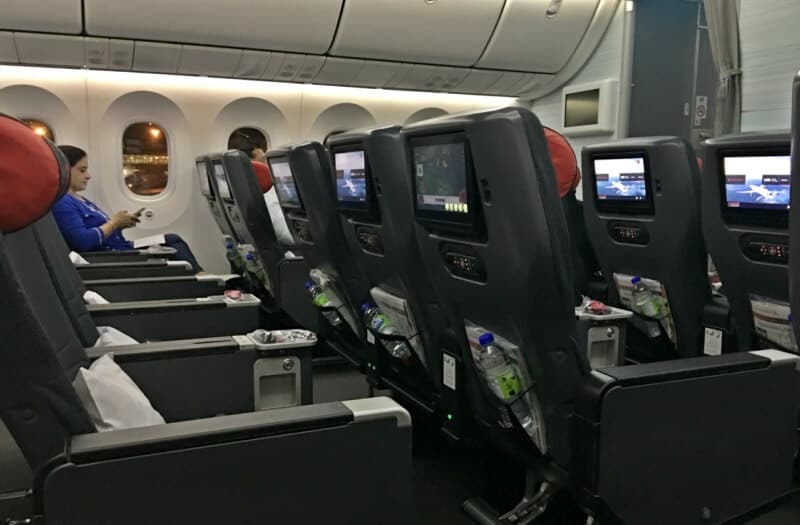 I was really exciting about flying to India on Air Canada’s direct to Delhi on a Dreamliner flight because I have never flown direct to India before. At about 13 hours, flying direct shaves about four hours off my usual route, which includes a touch-down in Europe. I anticipated this would make the trip less tiring, and maybe even cut down on the effects of jet lag. And while all this is true, I discovered something even better: the 787-9 Dreamliner itself. It was my first time flying this machine, and it really is a marvel – a big step forward in airplane design and efficiency. I honestly noticed the differences, and then started asking about the plane. 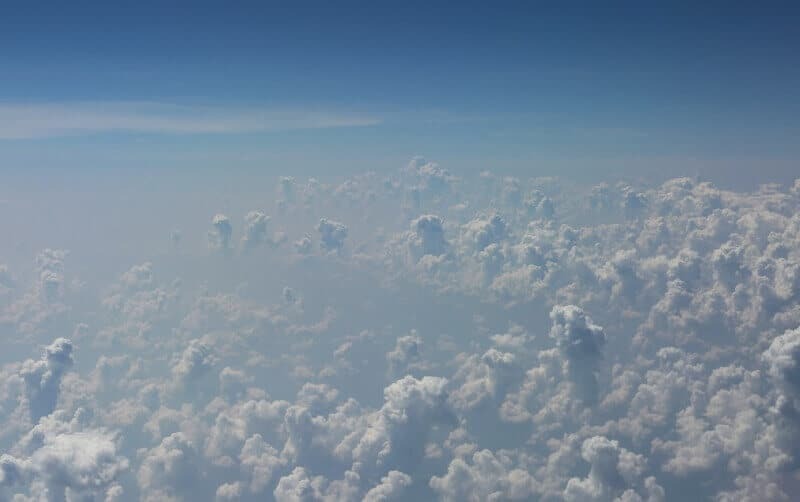 I noticed first that the air didn’t seem as dry, and the plane seemed quieter – both observations turned out to be true. Then I started noticing all kinds of details like big windows that become tinted at the touch of a button, very spacious washrooms, charging ports on the back of each seat. And on and on. As someone who is concerned about my carbon footprint and travelling responsibly and sustainably, I talked to a couple of experts and also did some research on this plane. I discovered that by flying direct I cut down on emissions, and that the Dreamliner is a more fuel-efficient plane than earlier generations. Air travel is carbon intensive, but fuel efficiency helps, and so does flying direct. I asked Rachel Dodds, owner of Sustaining Tourism and Professor of Hospitality and Tourism Management at Ryerson University, Toronto, Canada for her thoughts on air travel. I also talked to Vicki Smith about air travel. 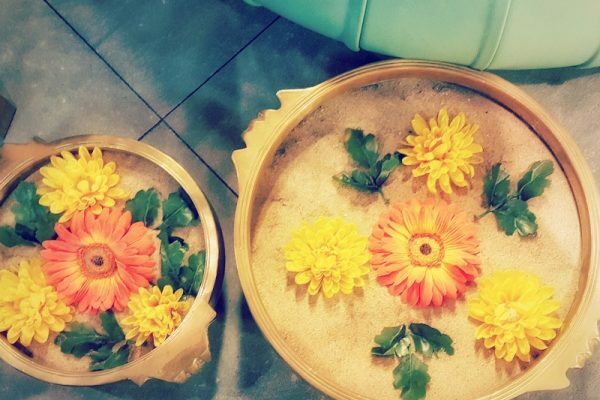 Vicky Smith has worked in travel for more than 20 years, witnessing first-hand the negative impacts mass-market, profit-focused tourism has on beloved people and places. She has been an impassioned champion of sustainable tourism for more than 10 years, and now runs the transformative tourism start-up Earth Changers. We each have the responsibility to gauge our own actions and inactions, and whether and how we want to address the environmental crisis. I choose to take one long-haul, return flight per year from Canada to India, and to do it as efficiently as possible. I stay for six months in India (and six at home in Canada). I’m trying to do my part by becoming informed and making responsible choices, whenever possible. By flying direct on the Dreamliner, I feel I am making the best possible choice available at this time. Thanks also to the Sheraton Gateway Hotel in Toronto International Airport for my overnight stay before boarding the Air Canada flight to India. The hotel is directly connected to Terminal 3, which makes it incredibly stress-free for catching an early morning flight, a long-haul flight, or when transferring in Toronto. And when they mean directly connected, they mean you can walk out the door of the hotel, along a pedestrian bridge, and into the terminal in about five minutes. 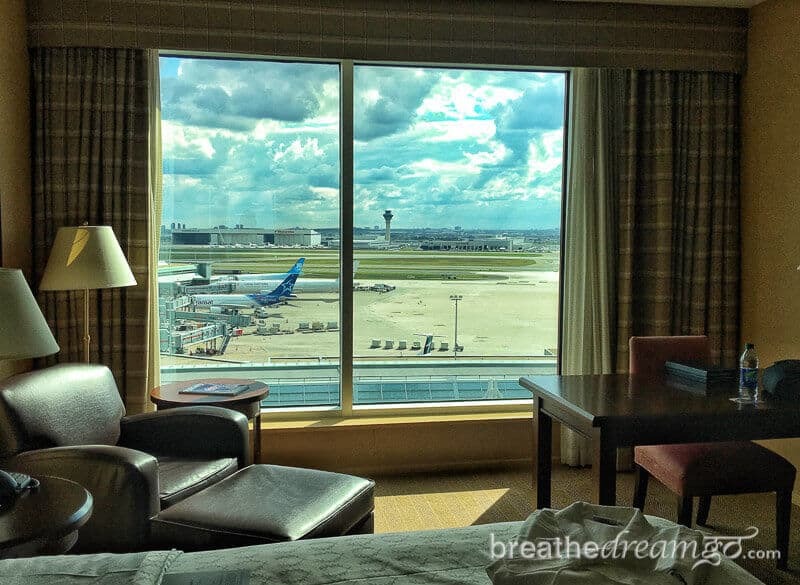 I was upgraded to a Club Room with a view of the runway – for a passionate traveller like myself, I found the scene very exciting. I loved watching the planes take off and land, ha. Made me feel like a kid. I also loved the handy Club lounge, which offers a complimentary breakfast in the morning, and hors d’oeuvres in the evening. They also offer a full range of business supplies and services, for business travellers. 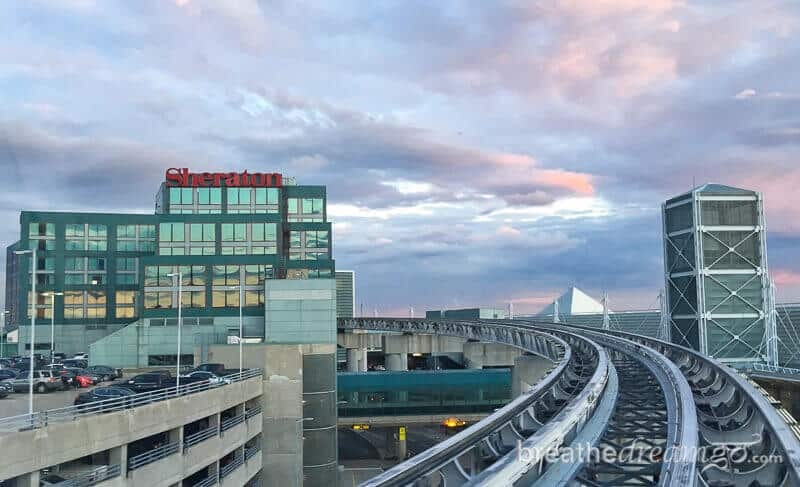 The Sheraton Gateway is a full service hotel, with bars, restaurants a fitness centre and pool, meeting rooms and even winter coat and boot storage for travellers heading to warmer climates. Highly recommend for taking the stress out of your flight and booking in here. And to get to the hotel, and Toronto Pearson Airport, I took the UP Express. This high-speed train connects the airport to downtown Toronto in 25 minutes, and is (now) very affordably priced. Again, I found taking the UP Express really reduced stress as the journey is so quick and the schedule so frequent (every 15 minutes). NOTE: I was hosted by the Sheraton Gateway Hotel, and by Air Canada, to experience the hotel and the direct flight to India. But as always, my opinions are my own, and the needs of my readers are my first priority.